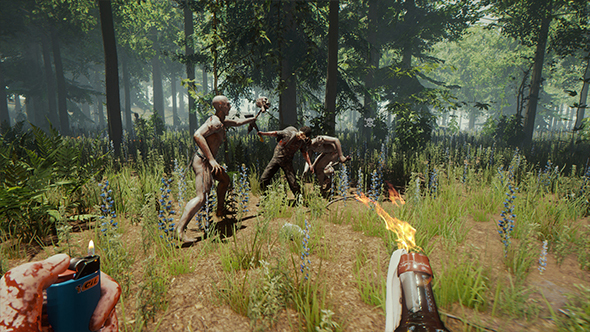 Update, April 7: The Forest will emerge from Early Access April 30, the developers have announced. Make the best of a bad time with the best survival games on PC. In a brief post on The Forest’s Steam page, Endnight Games say they’re ready to launch version 1.0 at the end of the month, marking an end to four years in Early Access. “It’s been a long journey and we’re really excited to show everyone what we have in store,” they write. The game’s price will increase from $14.99 to $19.99 then, and there’s quite a stack of new features coming alongside that final release. Language and controller support are set for improvement, new reasons for taking on the bad guys will be introduced, and the temperature system is set to undergo a “rethinking” that includes a new warm suit. “Big performance optimizations especially for late game saves” are on the way, as well as improvements to the workings of multiplayer saves and dedicated servers. Multiplayer clothing’s being expanded, including a system to let you switch outfits, and new buildables are on the way, too. Details on a VR mode are also set to be revealed closer to release. The developers also promise some “crazy and fun surprises,” especially as they regard the ending. As they prep for 1.0, smaller timed patches will stop in the meantime. The studio will be keeping the community in the loop with by putting out release candidates leading up to the launch.